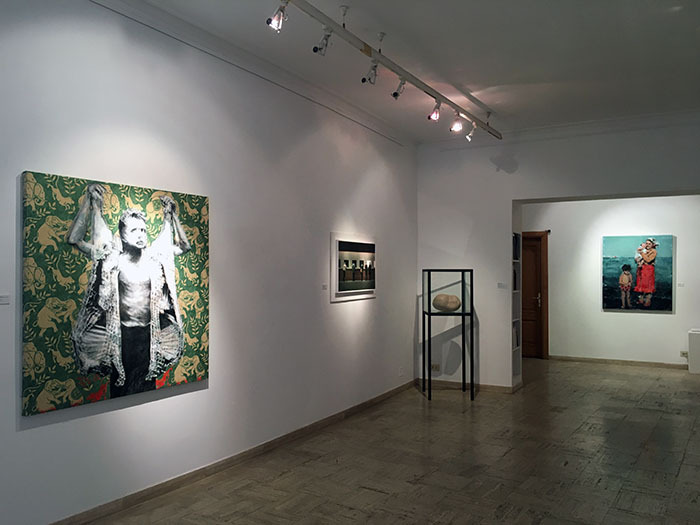 Homage is the title and inspiration behind the exhibition on display until the 18th of March at MAC Maja Arte Contemporanea. 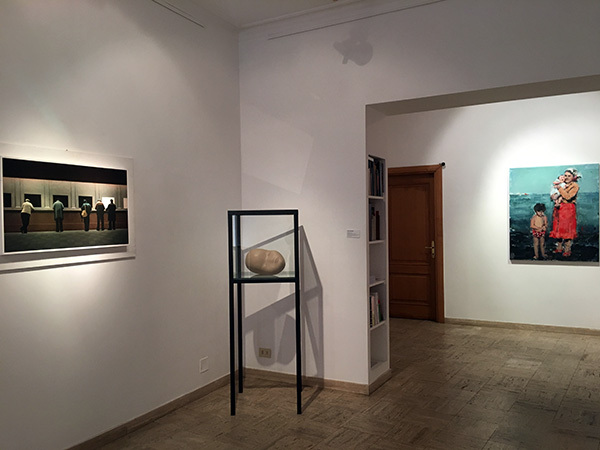 Isabella Ducrot, Angelo Titonel, Leila Vismeh, Janine von Thüngen, Gaetano Zampogna present six works - five paintings and a sculpture - paying homage to Austrian composer Arnold Schönberg and artists Pablo Picasso, Edward Hopper, Constantin Brancusi and Francis Bacon. Three of the works mention the tribute in their title. Such is the case for "Omaggio a Bacon" ("A Tribute to Bacon") by Gaetano Zampogna. Zampogna, who has recently completed a solo exhibit at the Fondazione Umberto Mastroianni, was inspired by John Deakin's famous photograph in this painting. A blurry and dramatic black-and-white image of Francis Bacon emerges from the green elephant-print fabric: the contrast is stunning. This painting is part of the cycle "Le macellerie" ("Slaughterhouses") that Zampogna has been developing since 2015. Interestingly, Bacon claimed he was always struck by the images of slaughterhouses and butchered meat. About them, he said: "are we anything other than potential carcasses? Whenever I step inside a butcher's shop, I am bewildered not to be hanging there myself, instead of one of those pigs." Isabella Ducrot's painting (pastel and oil on canvased paper, plastic and turkish embroidered fabric) was previously on display in 2008, at the National Gallery of Modern Art in Rome, and is dedicated to Arnold Schönberg. It is part of the cycle "Variazioni" ("Variations", 2006-2007), which is a tribute to a number of important musicians - most of them Russian, but two Italian, Scelsi and Panni - who transformed popular folk and peasant songs and religious chants into classical music. Painted in 2011, Angelo Titonel's work portrays Picasso's face as if it were a blown up photographic negative. He is caught in a provocative and symbolic gesture: his hand on his forehead, he stares at his audience intensely, seemingly capturing them. The work is part of a cycle of works that reverse images; through this technique, Titonel uncovers a singular dimension in each figure, as he digs into their intimacy and finds a more introspective identity, thus painting a 'reverse' portrait. 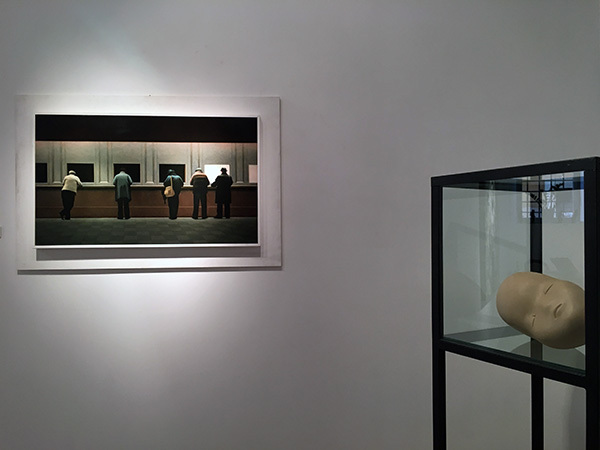 A second painting by Titonel "La biglietteria" ("The ticket office"), 1980, is also on display. In this work, the Venetian artist crystallizes an instant at a railway station's ticket shop, extending it infinitely. A deep silence echoes through the work, enhancing its melancholy. It is an image of solitude, but it is also oddly unreal (close to magical realism). The atmosphere is so exquisitely specific, one might easily call it Hopperesque, in the same sense that Picasso intended when speaking of his influences. Of them, he said, "we, the painters, are the true heirs, those who continue to paint. We are heirs to Rembrandt, Velázquez, Cézanne, Matisse. A painter always has a father and a mother; he doesn't emerge out of nothing". 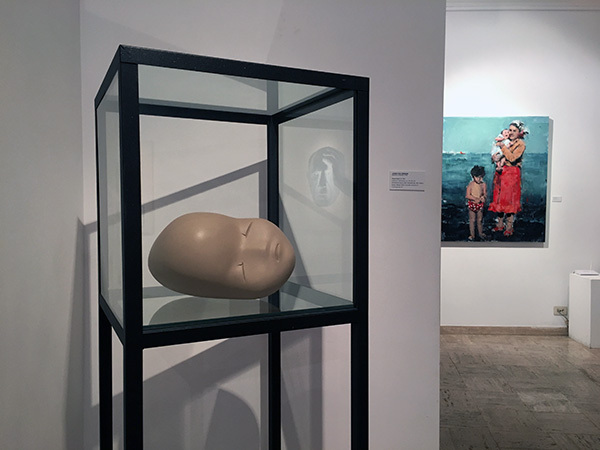 The only sculpture in the show - a sleeping head in fiberglass - is Janine von Thüngen's. Originally German, she has been working in Rome since 2000. The face's arched lips and soft, round forehead have a Brancusian elegance to them. This work explores the artist's experience with maternity: she observes her baby sleeping, as it slips into a suspended and impenetrable dimension. Further, she freezes that moment in her sculpture. The sculpture's protective case seems to enhance the moment, by reproducing an amniotic bubble. First displayed in bronze at the 2011 Biennale in Venice, the sculpture belongs to the installation "WasserKinder" (2003). Caught in unison, the works on display seem to declare: "all art is but citation". This is also true of Leila Vismeh's painting "Please Smile" (2014). The Iranian painter is now preparing to put one of her pieces on display at the "Art Capital" exhibition, Grand Palais, Paris (15 to 19 February). In "Please Smile", a young mother, perhaps a peasant, holds her baby, while her first child stands by her side in a red polka-dotted bathing suit and frowns. Behind them, a light blue sea fades into the bright sky. The painting calls to mind Giulio Aristide Sartorio's work, where the blue sea from Fregene often served as a backdrop for portraits of elegant young mothers, posing with their children. It also has echoes of the rural world and women captured by Michetti. "I am not afraid to lift from other art; I think artists have always done that," Lichtenstein said in an interview in the sixties. He believed that any image reworked could be given new life.